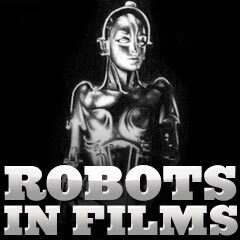 Robots in the Movies - Film History: Throughout cinematic history, especially in science-fiction tales, robots have always played a primary role. Throughout history and popular culture, robots have reflected the mood, social and cultural issues, and technology of their times. For example, in the Cold War 1950s, robots were generally viewed as threatening forces, but in later years reflected both the conflict and the continuity between man and machine. Robots have also functioned as both servant-helpers or oppressors of humanity, portraying the good and evil sides. Czech playwright Karel Capek coined the term 'robot' in post-WWI 1920 in his play R.U.R. (for Rossum's Universal Robots) that was first performed in Prague in 1921. It was taken from the Czech word 'robota' meaning work, to describe humanoid androids designed for menial and repetitive labor. In the play, docile mechanical creatures with human characteristics were produced in Rossum's factory, until one scientist gave them emotions and turned them into killing machines that took over the world. Robotic characters were often created, in part, as a way to probe and examine prototypical humans endowed with anthropomorphic (but artificial) intelligence or characteristics, or to express fears that humans could be replaced or displaced by robots that mimic human qualities.